What a funny coincidence that today, just a couple of days after you speculated about finding a house for us on the moon astronomers from Carnegie Institution for Science in Washington, D.C announced the discovery of the first extra-terrestrial habitable planet in the universe. For sure, the moon is much closer to the earth, to your family and friends, and you probably can even spot Sweden from there if it is “Full-Earth”. According to the U.S. astronomers, however, the living conditions on “Gliese 581g” as the planet was named, should be much more convenient than the surface of the moon. O.k., I have to admit, you have to spend more for transportation (Gliese 581g is about 20 light-years or 190 billion km away from europe, moon “only” 380 000 km), but I would be ready to spend some extra money for the flight tickets, but have a nice environment instead (like on earth, the value of a property mainly depends on the three factors “location, location and location”). Talking about the living conditions there, of course one cannot expect exactly the same as on earth, but I guess we could easily accomodate to them. For instance, the seasonal year is only 37 days long (whether there ARE seasons like summer and winter here on earth is not known yet). There are, however day and night, that”s for sure. And the day-and-night rhythm seems to be much more human (first estimate is between 25 and 35 hours) than what you have in northern Sweden with their 180 days polar-day followed by another 185 days darkness. There is one problem, and thats the mass of Gliese 581g: Since it is about 3 times heavier than the earth, physics unavoidably will give everything there a 3 fold higher weight. So the first weeks up there would be quite exhausting, walking, standing or dancing will be a tough physical exercise, untill our skelleton, joints and muscle strengthen and got used to carry this extra weight. The good thing and the best way to get around this stressful gravitational stress is the existence of water up there on Gliese 581g. Calculations show that there will be plenty of lakes, oceans and beaches, and the water should be crispy and cristal-clear. There just was no messy industry or agriculture or human sewage to spoil the water). And swimming, you should know, we would not feel our extra weight any more because of the (hydrostatic principle discovered by Archimedes). Anyhow, whether you believe him or not and whether you like spending most of your day in the water, it is good that neither you nor me have any weight problems here on earth. This is for sure a good pre-condition to relocate to Gliese 581g, and maybe they even want to see a health-certificate for this when you ask for entry visa up there. Hope you sleep well, and maybe in your dream discover some extra “must-sees” on this planet. PS: You don”t have to prepare you luggage right now. And for sure: You first have to finish your MSc project and got the degree, because this improves your chances to make a scientific career on “Gliese 581g”. what ???? I don”t wanna go to this extra-terrestrial planet ! I just made up my mind, and after struggling with myself again and again and weighing every pro and con, and talking with my family in Sweden I declined to consider a future here in Munich. Thats 980 km away from Stockholm, and I wont accept any further distance. Not the moon (“only” 380 000 km ha, ha, ha) let alone a planet that is so far away, that even the light needs 20 years to reach stockholm. So then, everything the U.S. astronomers discovered now only shows how this planet was 20 years ago. Things can change so rapidly, michael, just have a look on our earth and ourself: 20 years ago we didn”t had mobile phones, but instead Freddy Mercury and Frank Zappa were still alive. You have been in east-berlin working in the station-bistro and I was a 4-year old baby-girl carried around europe on the arms of my beloved parents. How can we be sure that during the last 20 years no massive industrialisation started on this strange planet, or that global cooling down turn all the lakes and oceans into ice-skating courses ? Thats my last word. This planet is not an option for me. And by the way, I came along this marvellous horse range this morning, on my way to the lab. 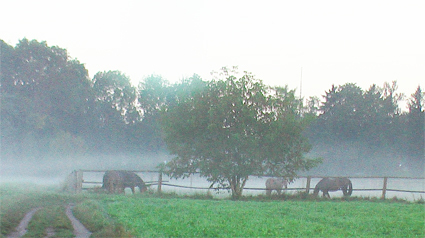 It was a mystic scenery, how the horse appeared slowly from the morning mist. . When I was a kid, my dad used to read me persian fairytales, in which a white camel played a role, because it rescued Zartusht (or Zaratustra as you call him) from the deluge. I think you mentioned this legend also on your blog entry form July 16th. I fell in love with this camel, and the horses I met this morning reminded me of it. I think their physical strength and mental calmness are similar, and that makes both of them good companions to men. 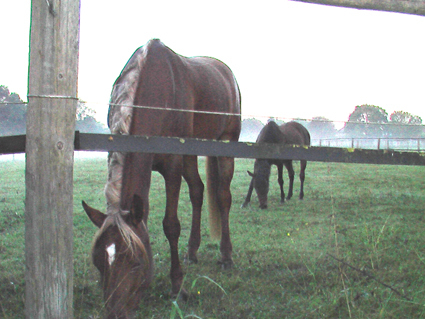 There was a display on the horse farm, and as much as I understoud german, they offered to give you one of the horses for riding out, if you agree to take care of it and clean it and feed it, it wont even cost a lot. So this, I have to admit, was one reason for me to consider staying in Munich. I doubt that there will be horses on this far planet, therefore I also don”t want to go there. Hope you understand my concern, michael. Have a good night, and good dreams. There is a slight mistake in your recordings of this habitable planet GLIESE 581g. Observations suggest that this planet does NOT rotate around itself as the earth is doing. This, consequently causes two very different climate zones: One pretty cold on the dark side of the planet (temperature perhaps below minus 100 degress), and the oposite, facing its central star that continiously heats it up and therefore wont be very convinient neither (could be as hot as 160 degress). So in fact the only really habitable zone (for man) would be a rather narrow transition zone between the two, were constant dim light would be, the sun always visible fixed at the horizon and, of course, now day and night cycle.